ISTOCK, COSMIN4000Early in 2016, a woman went to a clinic in Dallas to have a genetically modified adeno-associated virus injected into her eye. The woman was blind due to the degenerative disease retinitis pigmentosa, and the virus carried the gene for a light-responsive algae protein called channelrhodopsin. The goal was to induce her retinal ganglion cells—normally only downstream of cells that detect visual input—to make channelrhodopsin and become light-sensitive, giving her a rudimentary visual sense. That patient is thought to be the first in the world to have received a therapy based on optogenetics, the principle of using genetic modifications and light stimuli to precisely manipulate cells’ behavior. The technique enables researchers to turn the activity of certain genes in specific cells on or off at the flick of a switch, and has been a boon to biology research. Its fine-tunability also makes it an attractive tool for those searching for more-effective treatments for blindness and other conditions. 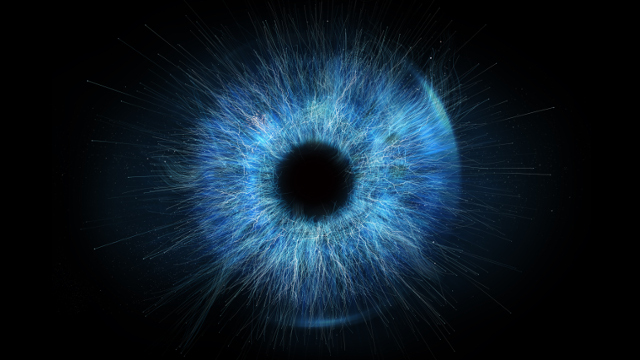 “I believe restoring vision probably will be one of the most promising applications for optogenetics,” says Zhuo-Hua Pan, a vision researcher at Wayne State University. Pan first learned about channelrhodopsins in a 2003 paper by another group, and soon afterward, his lab began working on putting them to use for vision restoration. 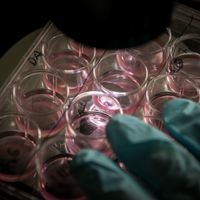 The idea was a new twist on gene therapy, which typically aims to replace a patient’s own defective version of a gene. Optogenetic gene therapy instead uses a protein from an entirely different species as a workaround. In this case, for people with degenerative diseases such as retinitis pigmentosa, in which the retina’s naturally photosensitive cells die, Pan thought those cells could be bypassed if the retinal ganglion cells that help relay retinal signals to the brain were themselves made light-sensitive. In 2006, he and his collaborators published a study showing that the strategy worked in mouse models; the animals ended up with a blue light–sensitive channelrhodopsin in the inner retinal cells, which began transmitting light signals to the visual cortex. Pan and his university would later license the technology to a startup company, now a part of Allergan, which is conducting the Phase 1 clinical trial in Dallas. So far, the number of trial participants is “in the single digits,” says David Nicholson, Allergan’s chief R&D officer, and they’ve received a low dose of the virus. While the primary purpose of the trial is to assess safety, “there is an indication that people who are totally blind can now detect light,” he says. Patients have reported, for example, sensing where in a room a window is located. Nearly two years in, no safety issues have arisen so far, and with the next patients to participate in the trial, the company plans to increase the dose. Pan and Allergan aren’t alone in thinking optogenetics is a natural fit for vision restoration therapy. 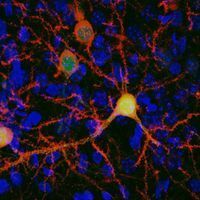 This month, a group of researchers in the U.S. and France reported in Molecular Therapy that coupling a more-efficient promoter to a channelrhodopsin gene spurred enough protein production to enable light at safe intensities to stimulate the ganglion cells of macaques, an effect that continued for at least six months after a single injection. What’s more, the treatment didn’t spur an immune response strong enough to damage the eye. “If you use an optogenetic approach, you can have one single shot with the virus, and then the opsin stays in the cell for the entire life of the animal,” notes Jens Duebel, a retina researcher at the Institut de la Vision in Paris and co-leader of the study. That’s partly because retinal ganglion cells don’t turn over. The group continues to work on ways to improve the therapy, such as using directed evolution to generate more-efficient viral capsids to deliver the channelrhodopsin gene, says Duebel’s colleague, Deniz Dalkara, a gene therapy researcher at the Institut de la Vision. Drawing partly on work from the Institut de la Vision, the Paris-based company GenSight Biologics, founded by some of the coauthors of the Molecular Therapy study, is planning to begin clinical trials of an optogenetic treatment for retinitis pigmentosa in 2018. Unlike in the Allergan trial, GenSight plans to use a channelrhodopsin modified to respond to red rather than blue light, says CEO Bernard Gilly, because excessive blue light can damage the retina. The company is also developing goggles to amplify light from the environment and convert it to a red wavelength for patients, he says. Although vision restoration may be the most obvious clinical application of optogenetics, it’s far from the only game in town. For one, the technique shows promise for developing a more effective version of today’s cochlear implants, says auditory neuroscientist Tobias Moser of Göttingen University. 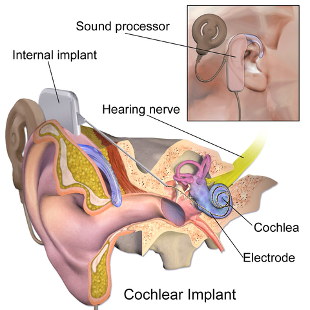 The cochlear implant is “such an amazing prosthetic device that half a million people require its use and hear and can understand speech, at least,” he says, but the devices come up short when it comes to understanding conversations in a loud room, listening to music, or discriminating the tones of a language such as Chinese. Comparing the cochlea to a piano keyboard, Moser explains, “what you do with an electrical implant is actually you’re not playing with your fingers but rather with your fist or your arm, because you’re hitting many keys at a time.” To gain more precision, Moser is working in mice on an approach that would put light-responsive ion channels into cochlear cells, coupled with a custom LED array to convert sound signals to light. The result would be “more spatially selective with the stimulation,” he says, which should enable perception of more frequencies. While Moser envisions harnessing optogenetics to play the cochlea like a piano, Silicon Valley-based Circuit Therapeutics would use the technique to equip nerves in patients’ skin with an on-off switch for pain. “Pain is a beautiful target because the pain nerve endings lie just below the skin surface,” says Chris Towne, a senior director and former postdoc of Circuit Therapeutics’s cofounder and optogenetics pioneer Karl Deisseroth. Its therapy would use an adeno-associated viral vector to deliver a blue light–sensitive chloride channel gene, coupled to a neuron-specific promoter, into the skin in an area where a patient experiences chronic pain. The patient could then use a flexible LED patch to stimulate the channels, letting chloride flood into cells in the area and lessening their ability to fire. Towne presented a study this week (November 15) at the Society for Neuroscience meeting showing that mice with postsurgical pain that were injected with a viral vector carrying a photosensitive chloride channel showed enough expression of the gene to relieve pain if exposed to light. The approach is likely only to work with peripheral pain, not with central pain such as migraines, Towne says. But he expects that if all goes well, the company could eventually modify the approach to target recurring pain far from the skin with implantable devices that would deliver light within the body. Chronic back pain, for example, could be treated with a light-emitting implant next to the spine. One potential problem with this and other clinical uses of optogenetics could stem from the presence of a foreign protein in the body, says Anthony Van den Pol, a neuroscientist and neurovirologist at Yale University. “The primary thing I would be a little concerned about is that you wouldn’t want autoimmune targeting of that gene, which then would generalize to the cell type in which you’re expressing the gene,” he says. 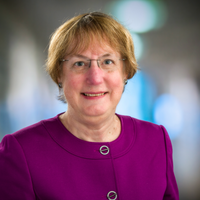 “It’s something the [US Food and Drug Administration] will be curious about.” That worry aside, Van den Pol says, the specificity and control optogenetics affords make it a promising avenue for developing new treatments for long-term pain, and for stimulating the brain. An implantable light-delivery device is central to another Circuit Therapeutics project, this one aimed at improving on the deep-brain electrical stimulation used for patients with Parkinson’s disease and other brain disorders. It’s difficult to control electrical currents in the brain, which can lead to side effects, Towne says, and the intervention’s mechanism of action is largely unknown. By contrast, “the nice thing about optogenetics is, you can now have a lot of rodent [and] nonhuman primate work where you understand the circuits and can say, ‘this is the therapeutic mechanism of action,’ and then you can replicate that using optogenetics in a person,” he says.